Prayer cards with relics depicting St. Bernadette, St.Peregrine, St.Martha, St. Pio, St.Theresa, Saint Anthony, Saint Christopher, Saint Francis, Saint Martin and Saint Jude. St.Benedict Relic Medal with Prayer. St.Christopher Relic Medal with The Motorist's Prayer. St.Gerard Relic Medal with Prayer. St.Jude Relic Medal with Prayer to Saint Jude. Booklet Picture Medal Our Lady of Knock with Prayer. St.Martin De Porres Relic Medal with Prayer. St.Peregrine Relic Medal with Prayer. St.Martha Relic Medal with Prayer. St. Pio Relic Medal with Prayer. St. Bernadette Relic Medal with Prayer to Our Lady. 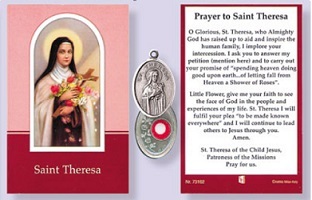 St.Theresa Relic Medal with Prayer to Saint Theresa. Saint Pio Prayer Card & Relic. Saint Christopher Prayer Card & Relic.